It used to be that having a pool in your yard meant a lot of work to maintain safe, clean water in it. Not anymore. Our salt systems and automation from Goldline Controls take the work out of owning a pool or spa. They make water sanitation and the control of key functions and accessories foolproof, effortless and automatic. We know that less work equals more play. And that's what the ideal pool or spa experience delivers - excitement, relaxation, pleasure. Be sure to visit the Goldline Controls website. We are also pleased to offer you the salt chlorination systems from Zodiac Pool Care. They make swimming pool and spa maintenance simpler for you and your family. As a world leader in aquatic and pool care pool products, Zodiac offers the most extensive line of quality pool care products and pool supplies available. Their line up includes automatic swimming pool cleaners with Baracuda Technology, mineral sanitizers and purifiers for pools and spas with Nature2 Technology and salt water chlorinators with Clearwater Technology. 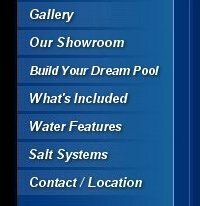 Learn more about Zodiac Pool Care products at their website.